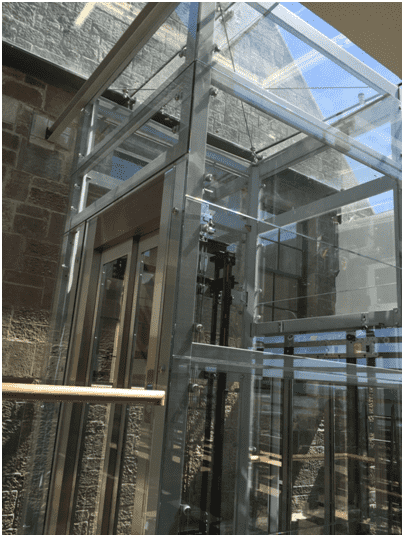 You may remember not so long ago we posted a blog about a Galileo (Traction 600) lift we installed in the new Argyll & Bute Council offices that were built in and next to the former Clyde Street School. A new office block was built on the former school’s football pitch, joined to the old building with a glazed walkway where our Galileo lift was installed. The innovative lift brought many benefits to the project and in this article we’re going to explain exactly how it helped the construction run as smoothly as possible. The Galileo lift is one of the most versatile lifts that can be installed in a building and this certainly helped with the Clyde Street School project. Certified to the EN81-1 and EN81-21 Lift Directives for low pit and low headroom, the Galileo lift doesn’t need the space to that other lifts might. This helped the architect of the project to choose a location for the lift without having to worry too much about locations where deep or high shafts may be an issue. The Galileo is also versatile in its size, being able to cater for 3, 4, 6 or 8 passengers with weight handling of up to 450kg or 600kg, allowing the architect to choose the correct elevator for the project. Like with most building constructions in the 21st century, the environmental impact of the building was a concern during the design phases. Whereas with some other lifts this may have been an issue, the Galileo lift is one that can actually be called eco-friendly due to its low power requirements. 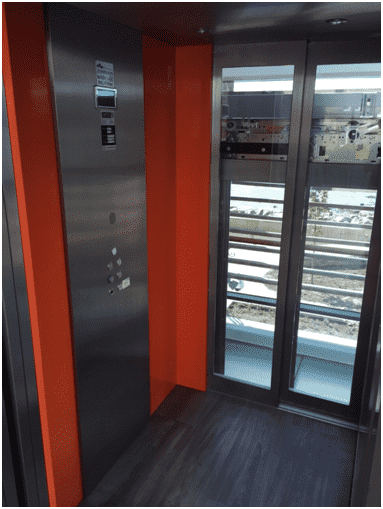 Even though the lift has a large capacity, the innovative technology and components that the lift use such as inverters and latest generation motors means that it can operate on just 2.2kW and is connected to a standard 220v single phase socket. It’s clear to see that the Galileo lift had a positive effect on this project with the combination of its low pit, low headroom requirements and eco-friendliness. It isn’t just this project that the Traction 600 lift can be beneficial for, its versatility means that the Galileo will be able to help in a number of constructions. If you’d like more information about the Galileo passenger lifts, or anything else that we can provide, don’t hesitate to contact our friendly team on 01200 405 005.